An important update affecting how to enter VOC, HAP, and VHAP data into the ERA-EMS software has been released to your ERA-EMS. The ERA-EMS is now capable of calculating the VOC content by weight, HAP content by weight, and VHAP content by weight for products for you. This calculation is done using the corresponding percentage data and density commonly included on most MSDSs. Previously, user were required to calculate these values outside the program. To calculate these values, enter the product density into the Density field and the % by Weight value of the corresponding VOC, HAP, or VHAP. Once these fields are complete, click the Calculate Buttons in the lower left corner of the screen. See the below image for an example. An example of using Density and % by Weight to automatically calculate VOC Content by Weight, Density HAPS and Density VHAPS fields. As seen above, the fields used to automatically calculate Content by Weight are highlighted in red. The calculation buttons are highlighted in orange. The fields that are automatically populated by the calculated results are highlighted in blue on your ERA-EMS screen. 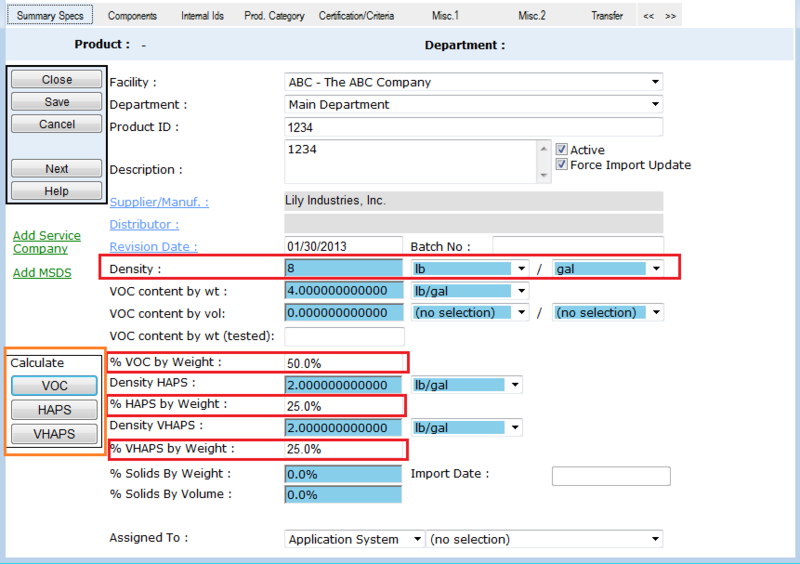 In this example, to calculate the VOC content by weight (wt), you would have to enter the product density, %VOC by weight, and then click the VOC calculate button. To calculate Density HAPS you would enter the product density and %HAPS by Weight then click the HAPS calculate button. If your MSDS for a product already indicates the VOC content by weight, Density HAPS, or Density VHAPs, you can simply enter that data instead of using the ERA-EMS to calculate them for you. It is important to note that the blue calculated fields contain the data that is used during the generation of emissions reports. If you change the data within any of the calculation fields but forget to click the calculate buttons to update the data in the blue fields, these changes will not be reflected in your final reports. In addition, there are now VHAP and HAP data fields on the components tab of the products set up menu. This enables the ERA-EMS to track VHAP and HAP data down to the component level. If you have any questions about these improvements please do not hesitate to contact your ERA support agent by calling us at (514) 684-6408 or by email at: tech_support@era-ehs.com.